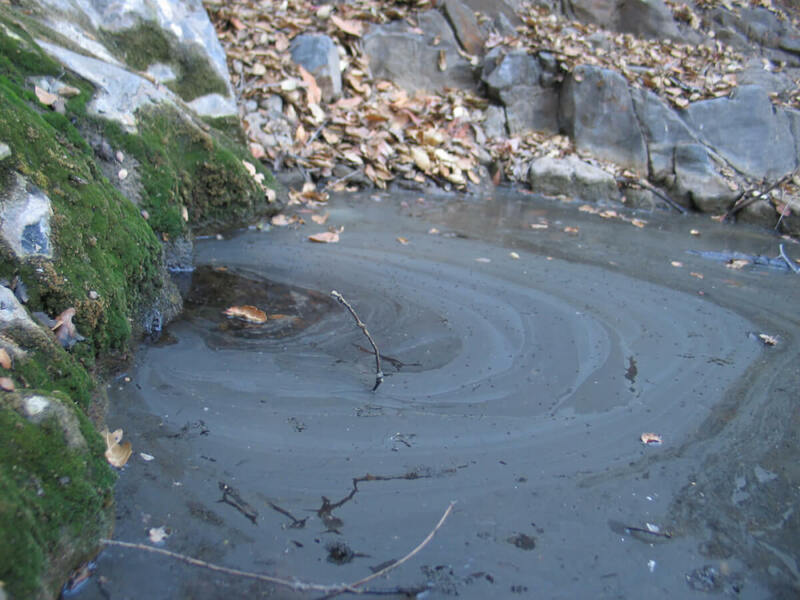 In drought conditions or especially arid environments where rainfall is less prevalent and finding a water source less probable, you are more likely to come across a small spring like this. Below the scum and bugs is potentially drinkable water, provided you purify it. If you spend any time away from the confines of civilization, then you know how important water is to your daily routine. The human body is a giant bag of water—we’re 60 to 70 percent water—and that bag must be refilled frequently. And it must be fresh water. In the backcountry of North America, water is a readily available commodity, as the climate of most of the wilderness is the perfect atmosphere for streams, creeks and rivers flowing with fresh water. However, how do you know that the next mouthful isn’t going to be swimming with Bacteria, viruses, protozoa, parasitic worm eggs and chemical contaminants? The last thing you want to concern yourself are the nasty effects contaminated water will have on your nervous system, let alone your digestive system. Toxic algal blooms; bacterial spores such as Campylobacter jejuni, Salmonella, Shigella, and Escherichia coli; viruses such as rotavirus, norwalk virus, and hepatitis A; parasitic worms like cestodes (tapeworms) and trematodes (flukes); and industrial toxins such as lead, mercury and cadmium all lead to unhealthy and potentially deadly drinking water. In North America, there isn’t much worry about parasitic worms, but if you are traveling abroad, it is a big concern. As well, chemical contaminants are few and far between in North America, especially in recreational wilderness areas. However, the complex parasitic protozoa are especially prevalent in most all water found in nature. Many, including Giardia lamblia, Cryptosporidium parvum, and Entamoeba histolytica, transform from free-living forms into dormant, but highly infectious, cysts when expelled in the host’s feces. Cysts are usually round or oval shaped and have tough shells, allowing them to survive long periods in water sources while they await ingestion by a suitable host in which they can reactivate into free-living organisms and reproduce. Compared to viruses, and even most bacteria, parasitic protozoa will wreak havoc on your digestive system. Giardia lamblia is one of the most well-known risks to drinking backcountry water. It is a protozoan parasite that enters the water via the feces of mammals and then attaches itself to the small intestines. It can cause diarrhea, vomiting, bloating, and weight loss. Cryptosporidium parvum is another protozoa species that populates fresh water in North America via the same method as Giardia. The result of ingesting water infected with C. parum is tremendous diarrhea. If you drink unfiltered water from a stream or river, realize that you didn’t pack nearly enough toilet paper for what will lay ahead for you. Concentrations of cysts vary depending on the water source and the exact location of feces in the water. On average, concentrations in water in wilderness areas of North America are usually below one cyst per liter of water. However, water in a beaver pond, for example, can average well over 100 Giardia cysts per liter. Raw sewage or run-off from land populated by cattle infected with Cryptosporidium can exceed 5,000 cysts per liter. In 1996, spring run-off in Cranbrook, British Columbia, flushed infected cattle feces into the town’s reservoir, which caused a massive outbreak of cryptosporidiosis that involved several thousand people. In 1993, in the largest ever North American outbreak, 400,000 people became infected with Cryptosporidium in Milwaukee, Wis., from contaminated drinking water. Adding to the potential for severe outbreaks is the strong resistance of Giardia cysts and total immunity of Cryptosporidium cysts to the chlorine used to treat urban drinking water. A possible solution is to carry enough bottled/filtered water with you that will last the duration of your trip, but in a survival situation, you can’t possibly know how long that will be. 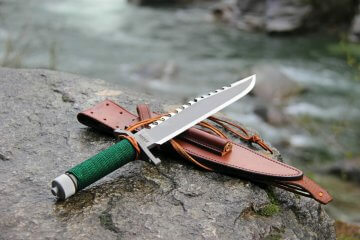 It could take days for you to hike out of the hills or weeks for the choppers to find you. What then? Your bottle water will have run out and you will slowly die of thirst. A person’s water consumption needs to depend on altitude, temperature, and the physical activity a person is engaged in. At rest, an average man needs about three liters of water a day (women need 2.2). A liter of water weighs roughly 2.2 pounds, so carrying enough water to last three days will add nearly 20 pounds of weight to a man’s pack. Plus, bottled water has an environmental impact. The production of the plastic and the fact that it takes 10,000 years to decompose is a detriment to its use. 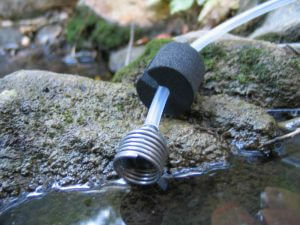 The best solution is to have a way to filter the water on the go. Carrying a water treatment system is much lighter than bringing all the water you need. And with a treatment system, you need only carry enough water to get you from one source to the next. 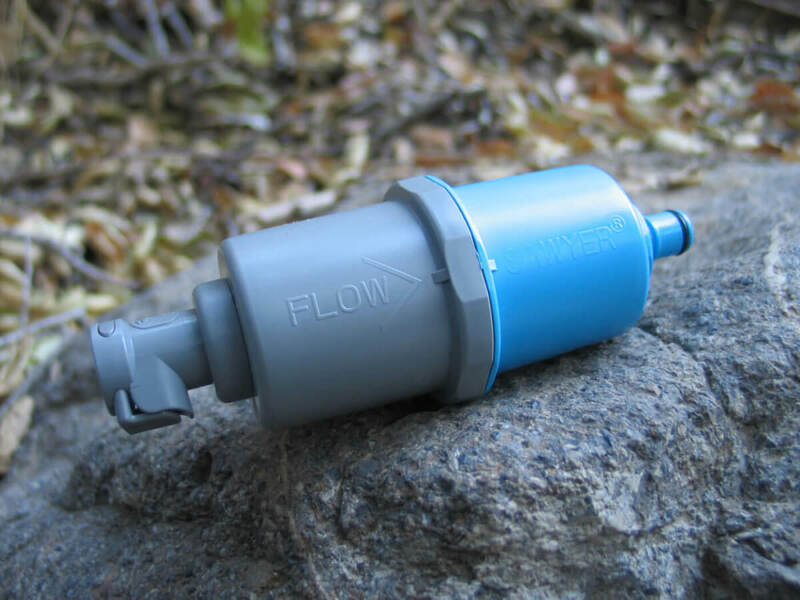 There are dozens of filters and chemical treatment options on the market for a wide range of situations and needs: pump filters, gravity filters, filter straws, chemical drops, and UV light. 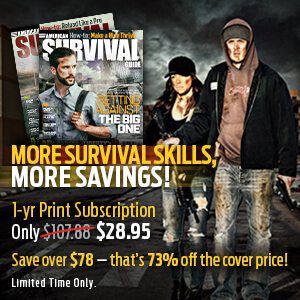 We narrowed it for you to seven systems that would work best in a survival situation. We discounted chemical drops and tablets. 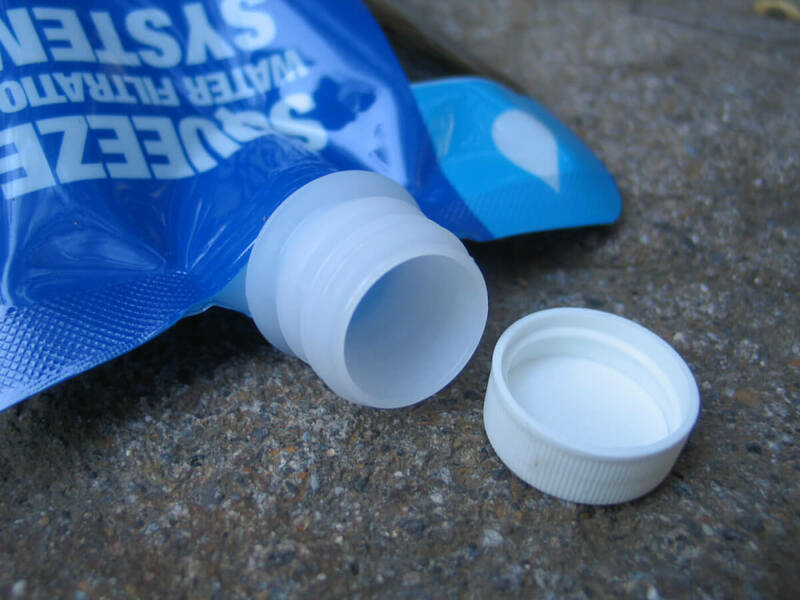 While they effectively remove the dangers in water, they leave behind the impurities (dirt, pebbles, and plant life) and tablets and drops can only treat a finite amount of water, whatever is in the bottle or however many tablets came in the pack. 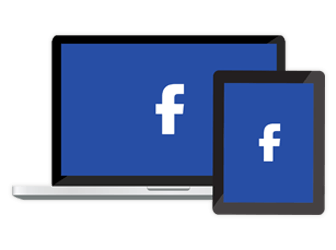 When the tablets or drops run out, you’re out of fresh water. Use of UV light systems, while futuristic and effective, relies on batteries and light bulbs, which both go bad and/or break. Selecting a water treatment system is even more overwhelming than selecting proper footwear to hike in, which is a much talked about topic. There are numerous factors to consider, from the basic categories of size, weight, and treatment time, to more complicated categories such as filter medium, the longevity of the system, and what types of organisms each system is effective at eliminating. Filters: They do well at eliminating bacteria and Cryptosporidium, but not viruses. They strain out the particulate matter (plants, bugs, and dirt) and usually improve the taste of the water. Chemical Treatments: They eliminate bacteria and viruses, but they eliminate Cryptosporidium usually only after extended time in the chemical solution. Chemical treatments do not strain out the particulate matter (plants, bugs, and dirt), and they usually have a negative effect on the taste of water. Plus, you’re adding chemicals to your body. UV Purifiers: Interestingly enough, UV light treatments do not actually kill pathogens. Instead, they disrupt the DNA of the organisms so that they cannot reproduce. The downside is that if you’ve treated the water and inadvertently allow it to sit in sunlight for a long period of time, the organisms can rejuvenate. The EPA approves of the UV process as a purifier (used in commercial applications), but does not actually approve specific UV devices that hikers can carry. Though weight is a big concern among hikers and backpackers, each of our systems is generally light enough that their weight is much less important than their function. 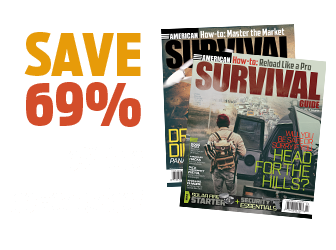 In a survival situation, you’d sooner give up the butane camp stove over a water filter system. However, take into consideration the packaging. Some filter systems don’t come with storage bags, which makes packing them rather inconvenient. 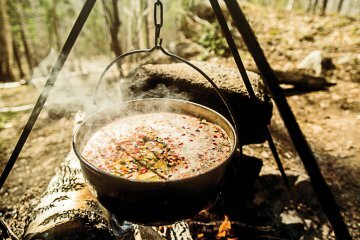 A much more important aspect to survival needs is the time before drinking, the time each method needs to be effective. Some are immediate, like the filter bottles and pumps, while tablets and chemical drops can take up to four hours. Usually, time is of the essence. 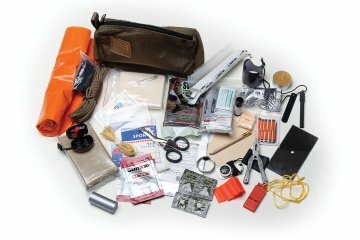 Unless you’re base camping in a remote area for days at a time, longer methods are acceptable, but if you’re on the run or need to extricate yourself from a hostile situation, you will need to get water as you go and cannot afford to waste time sitting around waiting for your water to be ready. There are other considerations when selecting a filtration system. How much water do you need to treat? Some can only accommodate a liter at a time (such as the canisters), while others have a never-ending supply. Collecting water for a group of people one bottle at a time can be tedious and inefficient, while gravity-fed filters have the ability to collect and treat a lot of water quickly, which is great for groups. If you are going with a filter-style pump/gravity-fed system, consider not necessarily the filter medium (the material that actually filters out the impurities) but instead the advertised micro size. This is a measurement of the pore size in the filter media. Essentially, the smaller the pore size, the more pathogens the filter can strain out. A simple rule of thumb is that the smallest bacteria is 0.2 microns, so a filter should be around that size or smaller to be the most effective. 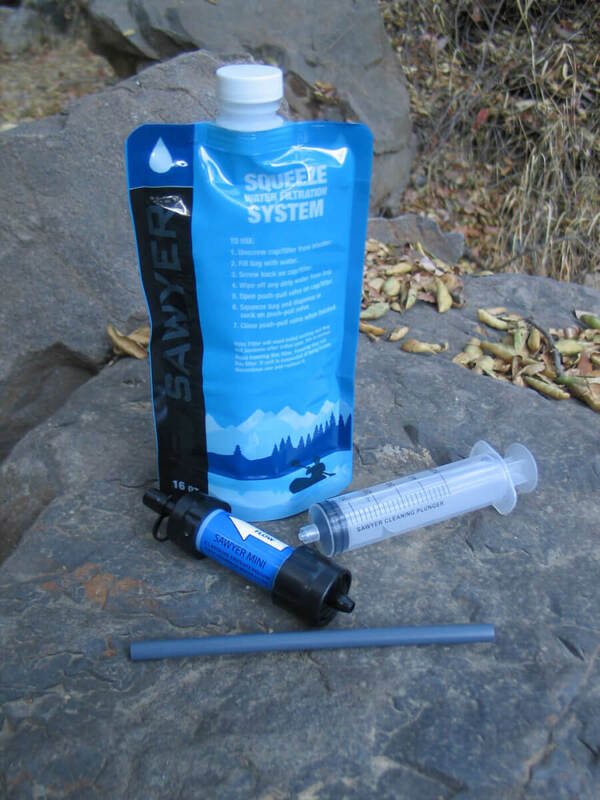 A small but versatile filter, the Sawyer Mini can be used either as a straw-style filter or can be attached to the top of a bottle. It is the lightest filter available, simple to use, and a great value. With a 0.1-micron pore size, the Mini is effective against protozoa, bacteria, and Cryptosporidium. It does not treat for viruses. 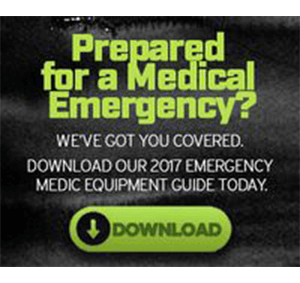 Since it has no moving parts and no batteries, it is less likely to break or not work when you are out in the wilderness and need it most. We find this filter to be very reliable. 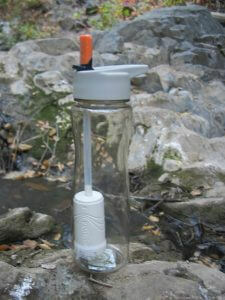 You can use the Mini to drink directly from a source and it works best with the straw attached directly to the filter. It can also be screwed onto a water bottle, and the filter comes with one 16 oz. soft bottle that stows away in small places. Since you can drink directly through this filter like you would a straw, the treatment time is instantaneous and relatively effortless. 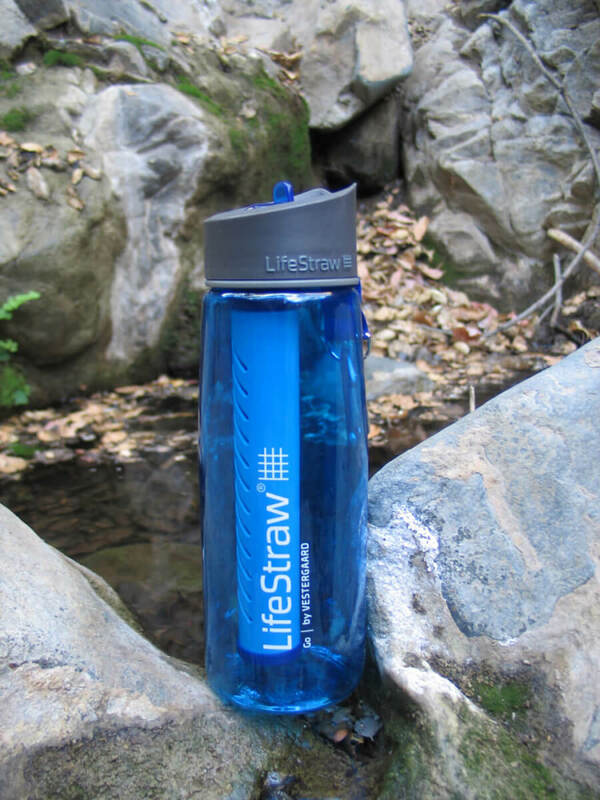 With a total weight of 2.4 ounces for filter, bottle, and straw, it is inconsequential to include in your pack. The manufacturer states that the Mini can treat 100,000 gallons before needing to be replaced, which means it could last for many, many years (if you drank two gallons of water every day through this filter, it would last for 136 years). 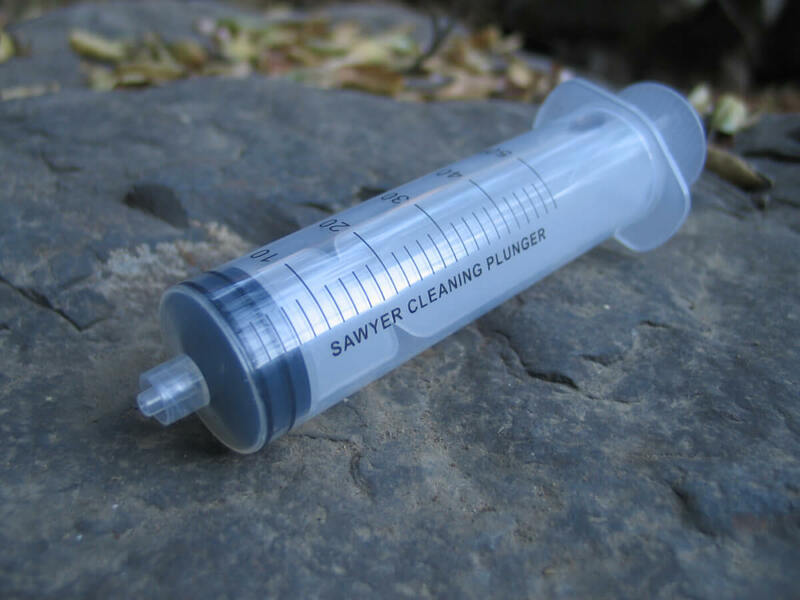 Of course, depending on how cluttered the water is, you will have to eventually back flush the filter with the included syringe, but you can use the filter for a decent number of times before this is required. As well, do not let the unit freeze, as this will damage the hollow fiber membrane inside the filter. The include syringe is needed to occasionally back flush the filter of the built up particulate matter that was filtered out. Doing this the first time will give you an idea of how well this filter works. The Platypus GravityWorks filter system combines filtering with storage, as it is available in either a two- or four-liter capacities, which makes for an ample supply of water for a base camp situation. 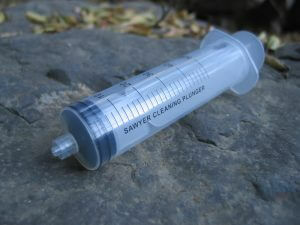 It is quick, easy to use, and is best for creating clean water for larger groups of people. The hollow fiber filter is effective against protozoa and bacteria but not viruses, therefore it is best for North American travel and not international use. The absence of moving parts or batteries means that it is less likely to break, but the plastic storage bags can be punctured, rendering the system useless. As with all filters, don’t allow this one to freeze; doing so will damage the fibers in the filter. Despite the hoses and bags packed in the box, this system is very easy to use. 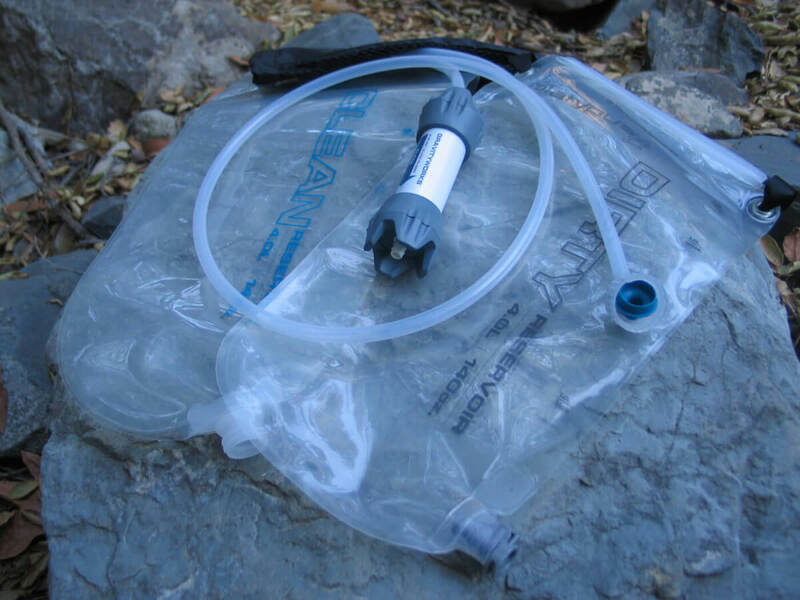 Simply fill the bag labeled “dirty” with dirty water, zip the top, attach the hoses with the arrow on the filter pointing towards the clean bag, and set the dirty bag somewhere above the clean bag, such as secured to a tree or a rock (a strap is included). The dirty bag has a zip-lock top and the clean bag does not, so mistaking the two is difficult; however, the hoses can get mixed up when packed away. This filter system was designed to treat large quantities of water for groups or for cooking. The four-liter system can store and carry up to eight liters of water at a time (four clean and four dirty), and the whole system will treat an entire gallon in less than five minutes. With the included storage bag, the system weighs just shy of 12 ounces, and the maintenance on this system is very low; back flush before each use by elevating the clean bag above the dirty bag until the bubbles stop. The filter is good for 1,500 liters, and the water flavor remains unchanged. 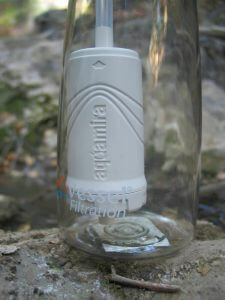 If anything was going to break, it would be the plastic screw cap that attaches to the clean water bottle. 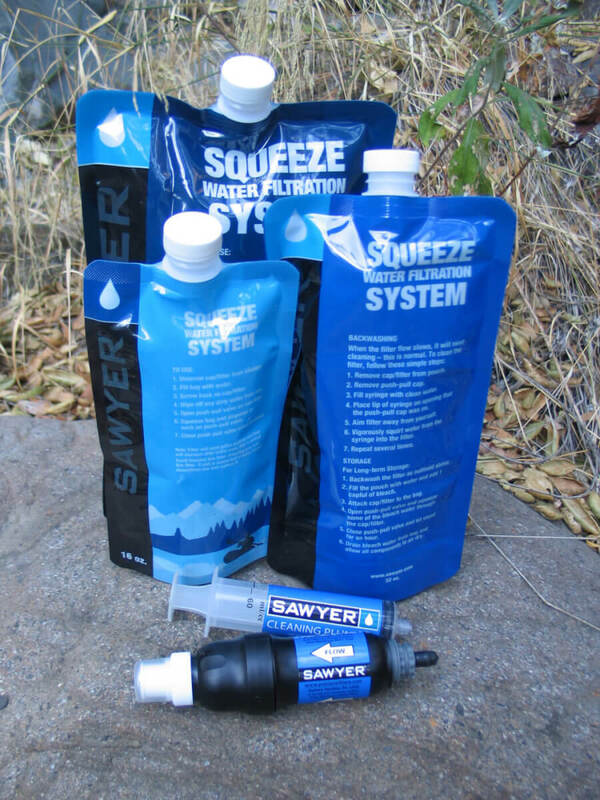 The Sawyer Two-Liter Gravity Flow Systems Filter removes particles, protozoa, and bacteria down to 0.10 micron in size, including giardia, salmonella, cryptosporidium but not viruses, which makes it unsuitable for international travel. It is remarkably easy to use. Simply fill the included gray reservoir with unfiltered water, attach the filter and filter hose and let gravity fill the included blue reservoir with clean water. The dirty water reservoir is labeled “do not drink” in several languages, and has a convenient plastic handle for when dipped into a water source. However, if you are at home, the system also comes with a faucet adapter. The overall weight of the whole system is just 12 ounces, but because it lacks a bag to store it all in, wrestling the bags back into their original configuration can be difficult. The filter is guaranteed to last for one million gallons before needing replacement. The manufacturer boasts a “million gallon guarantee,” meaning that you will never have to replace the filter, ever. Additionally, the dirty bag, when used to collect water, has a large mouth to collect water with. The nylon bags, opposed to the plastic bags used with the other filters, are stronger and less likely to puncture. 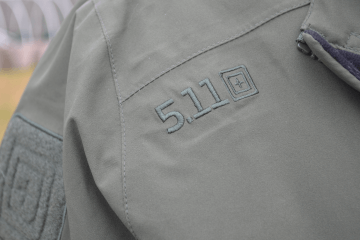 This means that the system will last longer and is more suited for whatever rugged situation it might be in. 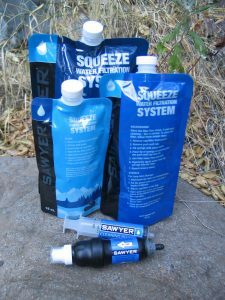 Differing from traditional pump filters, the Sawyer Squeeze consists of a small filter that can screw onto small-mouthed bottles or to one of three differently sized collapsible bags that come included with the filter. It is a lightweight, inexpensive, and a compact treatment method that works well for personal use but would be hard pressed to accommodate a group of people. Since there are no moving parts to this filter, it is unlikely to break and it is effective against protozoa, bacteria, and particulate, but does not treat for viruses. It uses a 0.1 micron, hollow-fiber filter to strain out pathogens, and this pore size is the smallest of this group of filters, which means that it can eliminate very small organisms. The total weight of the system is a mere 5.1 ounces, and that includes all three bottles (while the filter alone weights 2.7 ounces). 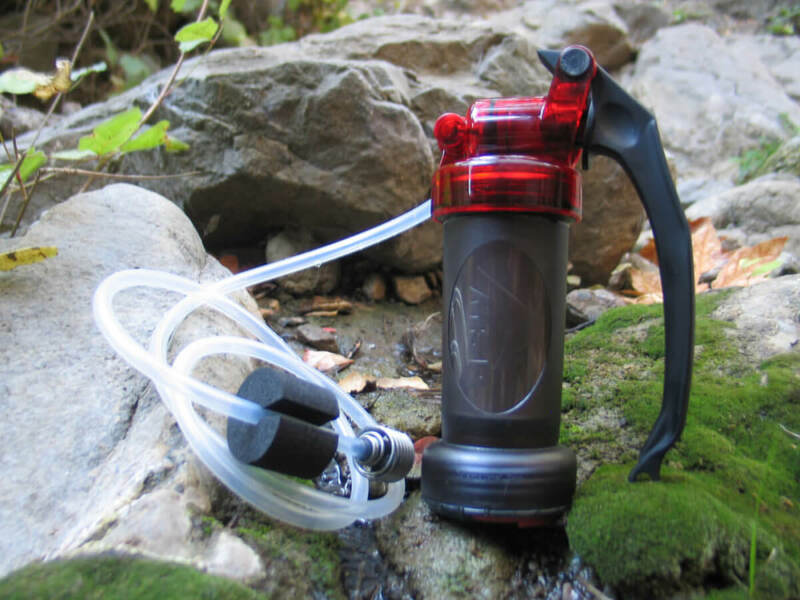 Since you can drink directly through this filter, it is a quick option for fast water on the go (though it is inefficient to use this as a source of cooking water). To use this filter, simply screw it onto one of the included bags or a small-mouthed water bottle and drink directly from it (or squeeze the water into another vessel). The manufacturer claims that this system can treat up to a million gallons, which means you’ll never have to buy another system again. However, the collapsible bags that it comes with will not last a lifetime (but they are inexpensive). The small mouth on the water bags make it difficult to collect from shallow sources. The only downside that can be found is that it might be difficult to collect water into the small mouths of the bags, especially if the water isn’t free flowing or deep but instead, a small puddle. 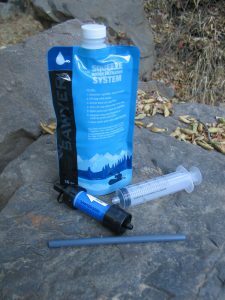 Also, the filter holds water inside of it after use and will leak out after a while (in your pack if you put it away). As well, it doesn’t come with a carrying bag. 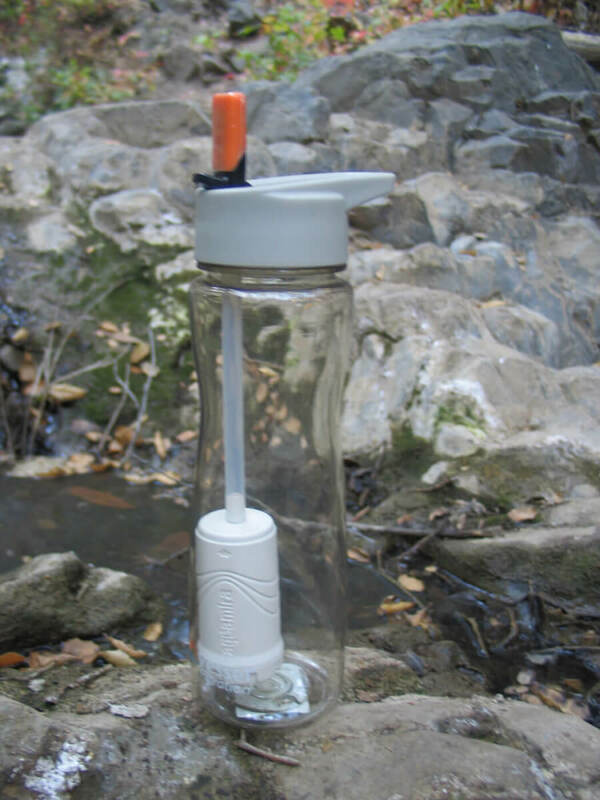 Because it is a water bottle with a filter contained inside, it makes a good option for hikers and long-distance walkers who want to bring a bottle along with them and still treat it, though it is a heavy option (especially the insulated version) for multi-day backpacking trips. The activated coconut shell carbon filter strains out 99.99 percent of Giardia and bacteria, as well as chemicals and heavy metals. It also filters out Cryptosporidium, which is the cyst that most chemical treatments such as iodine do not eliminate. It seems very reliable, except for the fact that it is difficult to drink from the straw with the filter attached. The water flows very slowly, which might be frustrating for a thirsty hiker. 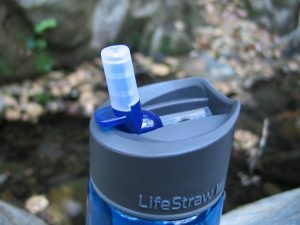 However, an option is to skip the bottle and drink directly from the source with the included straws. At more than 14 ounces, the Aqua Vessel is not the most weight efficient method for the volume of water it filters (0.75 liters at a time.) If you would carry a water bottle with you anyway, then the filter itself doesn’t add much weight and the bottle does add convenience. The good side is that there is no wait time before drinking; you can drink immediately after filling it. However, the flow through the straw is slow, so no gulping of water will happen with this one, and it would be difficult to dispense water into a cook pot. 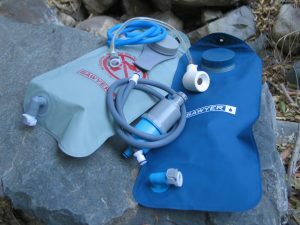 The non-insulated version of the AquaVessel is lighter and slightly smaller. This bottle is good for 378 fills before the filter needs to be replaced, which is only 283.5 liters of water (74.8 gallons). The LifeStraw effectively strains out bacteria and protozoa, including Cryptosporidium, through its hollow fiber membrane, but it does not treat for viruses. 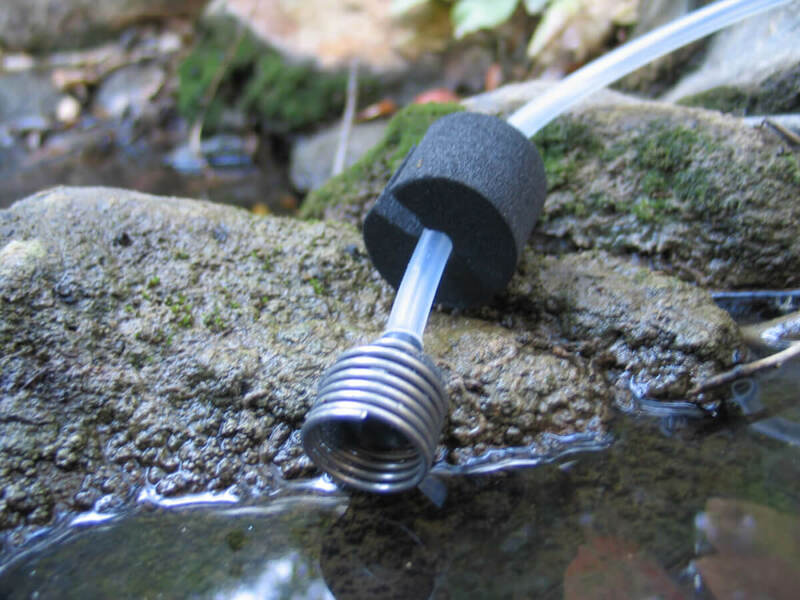 This straw-style filter is incredibly easy to operate but suffers from the limited amount of water that can be filtered at a time, best for a single-user rather than a group. 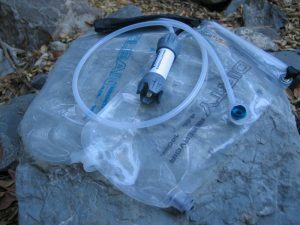 The main downside to this filter (similar to the LifeStraw straw that is very popular among backpackers) is that you cannot treat water with it and then transfer the water to another vessel, so you can’t use it to treat water for cooking or for groups. You can only drink through the filter. If you are backpacking and need to bring water with you between sources, you will need to carry a bottle of dirty water with you and drink through the Straw whenever you are thirsty. Keep in mind that doing this contaminates your vessel, and you will need to drink through the filter out of it every time until it has been properly sterilized. It can filter up to 264 gallons of water before the 0.2 micron filter needs to be replaced, and the bottle can hold 670 mL of dirty water. The retractable straw has a plastic cover that will nearly immediately get lost, but the unit comes with a carabiner. The MSR Miniworks EX is a robust and sturdy filtration system. The ceramic filter with a carbon core is effective against bacteria, protozoa, and cysts, as well as chemicals, herbicides, and pesticides. 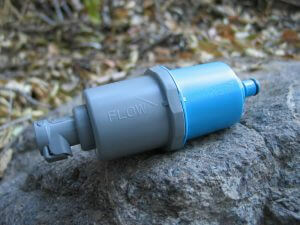 This ceramic filter is good for up to 2,000 liters of water, which is 528 gallons. At 16 ounces, it is the heaviest filter in the group and one that will have a lot to live up to in order to earn a place in a weight-conscious backpacker’s gear. This filter is easy and simple to use. 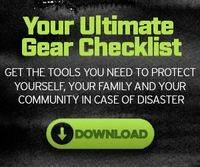 Simply drop the hose into any water source and begin pumping. At the end of the hose is a coil of wire that will keep it off of the bottom of the stream or lakebed, while an adjustable float helps suspend the end of the hose at whatever desired depth. The handle is chunky and strong, which is good for pumping, but it requires a lot of force to pump to push the water through. It is quick to take apart for maintenance and comes with an attached red plastic disc for scraping the filter when it clogs (as well as measuring it for replacement). Ceramic filters last by far the longest of any other filter media. They may require frequent cleaning if they become clogged, but the filter itself will last longer than any of the other filter. And it even improves the taste of the water since it filters out chemicals as well as pathogens (even chlorine and iodine flavors). 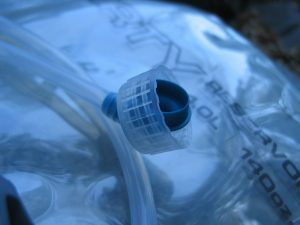 Since this filter is the hardest to physically pump, it took around 30 seconds longer (two minutes) to pump a full liter than any of the other filters, but still does not require a long wait like the chemical treatments. The coil of wire and piece of foam keeps the end of the hose suspended in the desired level of water, not floating on the top and not scraping along the bottom but in the middle, where the cleanest water resides. 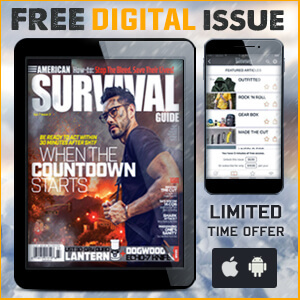 Editor’s Note: A version of this article first appeared in the January 2015 print issue of American Survival Guide Magazine.